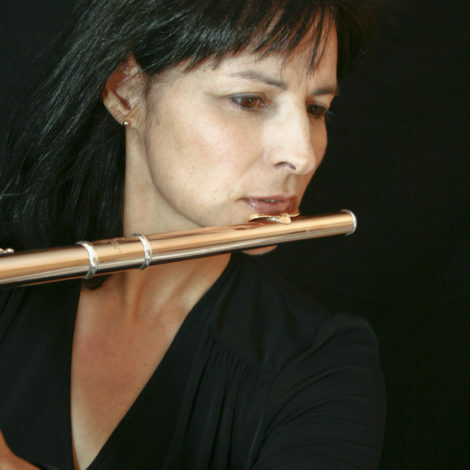 Flutist Yvonne Chavez Hansbrough has a music career spanning over 20 years in teaching and performing nationally and internationally. She held faculty positions at New Mexico State University, Middle Tennessee State University, and The University at Albany. She is currently Professor of Music at The College of Saint Rose, principal flutist of the Glens Falls Symphony Orchestra, and director/flutist of the Saint Rose Camerata, faculty chamber ensemble in residence at The College of Saint Rose. While in Tennessee she formed the Middle Tennessee flute Society. Hansbrough attracted hundreds of flutists and teachers to the annual Middle Tennessee Flute Festivals and master classes 1990-1999. She hosted many notable flutists including James Galway, Jean-Pierre Rampal, Susan Milan and many others. She organizes Flute Day events at The College of Saint Rose hosting many flutists including Elizabeth Rowe, Linda Chesis, Alexa Still, Amy Porter, Robert Aughtry, and Inna Gilmore. Hansbrough has performed at many national and international venues including Piccolo Spoleto Chamber Music Festival, Boston Early Music Festival, Blair School of Music, Troy Music Hall, EMPAC, Virginia Commonwealth University, WAMC Linda Norris Auditorium, and WPLN “Studio C Live” in Nashville. She toured as a soloist with the Varna International Chamber Orchestra in Bulgaria in Greece in summer 2015 and performed and taught at the University of Szeged, Hungary in November 2017. As a two-time winner of the National Flute Association Performer’s Competition, she performed at NFA Conventions in Orlando and Kansas City, MO. She was invited to perform at the convention in Atlanta, 1999, in New York in 2009, and Las Vegas in 2012. She appeared at the 2014 British Flute Society Convention in Coventry, England. She has performed with many orchestras including the Nashville Symphony Orchestra, the Huntsville Symphony (Alabama), the Nashville Chamber Orchestra, the Albany Symphony, Glimmerglass Opera, and the Martha Graham Dance Company (Copland’s Appalachian Spring). She toured as principal flutist with the Albany Symphony’s Water Music tour, summer 2017. Holding a strong interest in baroque performance practice, she plays baroque flute in solo, chamber and orchestral settings. Her baroque flute playing has been described as “haunting and memorable” (Times Union, June 2006). She performed several seasons at the Baroque Festival in Greenfield Center, NY, several solo and chamber concerts at UAlbany, Skidmore College, and with a period-instrument orchestra at The Cathedral of All Saints. She performed at the 2009 and 2013 Boston Early Music Festival fringe concert series with Empire Baroque. Having premiered several works by living American composers, Hansbrough is a strong advocate for new music. She has performed premieres of works including the Sonata for flute and harp and the Sonata for flute and guitar by Robert Baksa, and the Sonata for flute and percussion by Dr. Bruce Roter. She collaborated in performances with several composers including Max Lifchitz, John Anthony Lennon, Mario Davidovsky, Bruce Roter, and Andrew Lee. Published CD recordings include “Harvest Home” with Nashville Chamber Orchestra as principal flutist with Molly Mason and Jay Ungar on Angel Records. The disc was featured on NPR’s “A Classical Thanksgiving Harvest” in 2008. Additionally, she recorded several CDs with the Albany Symphony (Naxos and Albany Records labels). Her solo CD “American Flute Music: Leaving the Twentieth Century” represents important compositions of the late 20th century for solo flute and flute and piano. She is currently working on a CD/Book project: 18th Century Solo Works for Flute in Historical and Performance Contexts: A Manual of Performance Guides, Editions and Accompanying Compact Disc Recording. Eighteenth Century solo works for flute: Performance Guides and accompanying compact disc recording (received a Scholars and Artists Grant from The College of Saint Rose) Currently in the process of publishing CD; includes music by Boismortier, Quantz, Bach, and Telemann. Saint Rose Camerata, faculty chamber ensemble in residence at The College of Saint Rose; Hansbrough is founding director/flutist of performances since 2003. Each concert season the Camerata presents a series of four concerts of diverse programming. Members of the ensemble perform recognized masterpieces, unfamiliar works and newly written compositions. The varied programs, often based on creative themes, are presented in mixed ensembles of strings, winds, voice and keyboard. Performances are featured on WAMC “No Ticket Required” programs since 2016. Off campus venues include Colgate College and NYSSMA Winter Conference. Yoga for Musicians: completed 200-hour training in Hatha and Vinyasa FLow Yoga at Frog Lotus Studio in N. Adams, MA; interest in how Yoga can benefit well-being of musicians; taught workshops at The College of Saint Rose, Skidmore College, The National Flute Association Convention, and The British Flutist Society Convention.